Tons of nursery decorating ideas right here waiting to inspire you! Decorating a baby's room is an incredibly satisfying project, especially when you enter that "nesting" stage where you have sudden boundless energy to paint the ceiling at 3:00AM. (Please note: this may not be as much fun for your partner when you are ordering them around at 3:00AM, "Move that chair..." "No, try it on the other side of the room...") but I digress. Nursery! Decorating! So much fun! The following pages have projects and ideas to get you started and to get your creative decorating juices flowing. If you are on a limited budget, not to worry because so am I! I'm not even going to suggest you buy that $4000 crib with the $1000 crib sheet set, there are plenty of websites that will give you those "helpful" suggestions. These tips and projects are for the folks who want the $$$ style on a limited budget and are willing to roll up their sleeves and get a little creative. This is where the fun begins! Browse Childrens Bedding to set your entire room's color scheme. These ideas are especially for those of you who can't paint directly onto the walls because you are renting or are planning to move eventually. Really lovely nursery decorating ideas that can easily be altered, changed or simply taken down as the child grows and their interests change. Create a wooden wall calendar for your little one to learn with! 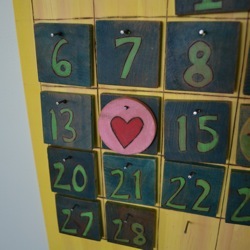 This sturdy wooden calendar looks great on a wall, will last for generations and is fun to play with too. You'll never need to buy another calendar and this one can be customized just the way you want. With chunky wooden dates and holidays your little one will be excited to update his or her calendar each day. This is a wonderful way to cover and decorate a large space without doing a permanent mural or spending any money on art! Instructions on how to enlarge an image online for free. 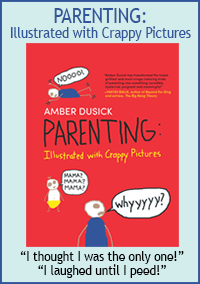 Pick a photograph, art or children's book illustrations to match your theme. Looking for inspiration? Check out this gallery of nurseries and playrooms that focus on natural materials such as wood, cotton, bamboo and wool! Eco-friendly design is beautiful, warm and inviting and this gallery is sure to inspire you to create a natural space. Instructions for making wood letters, fabric sewn letters and decorating pre-made wooden letters on the cheap for the wall and for shelves. These projects are very versatile. Use them for initials, monograms, baby's name, alphabet theme or even spell out a favorite quote from a children's book. Easily decorate baby's room walls with nursery wall decals made of vinyl. No mess, and these aare removable, which is great for renters! Check out the variety of designs and colors available to fit in with any decor theme. Start a yearly tradition of adding your child's photo to a fabric pennant banner. Over the years it will stretch all the way around your child's room and this is a unique way to celebrate the passage of years. Complete tutorail and a free pattern to download for sewing! Have your baby participate in decorating their own room! Even tiny babies can participate with hand and/or footprints. Many variations you can explore with this simple project and your child will love to see his/her artwork hung across a room. Really easy toy box project that you can build - even if you are a total newbie at woodworking. The best part is how you can customize it to suit your nursery decor theme. Robots? Ellepants? You can make anything! Very simple construction, with the front panel cut out into a shape with a jigsaw. This is of course something for baby to have a blast in when they grow older, but it also works as a wonderful accent piece in a nursery! Plus it is cheap to make, using just plain recycled cardboard boxes, duct tape and paint. Paint it to match your own house, your baby's room theme or the color scheme in the room. A fun way to reuse your baby food jars and transform them into pretty snowglobes! Create a miniature scene inside that coordinates with your nursery theme. Snowglobes have been mesmerizing children for ages, just keep in mind they are not toys but do make wonderful decor items. If you are making an effort to avoid plastic and buy only eco-friendly and natural items for baby, check out these beautiful and handmade items by these artisans. You'll be supporting independent (and work at home moms!) artists and you'll be buying items that are biodegradable and won't end up in a landfill. Are you looking for nursery more decorating ideas? Visit Creative-Baby-Nursery-Rooms.com for pictures of baby rooms, baby nursery design ideas, themes, pictures and advice.